#HEREWEGO – Team Horte second Kelly Mahoney cleans a rock in the hack during the Yukon junior women’s championship last month in Whitehorse. Yukon’s Team Horte and Team Wallingham will be part of one of the most talent-laden and experienced fields in the history of the Canadian curling junior championships. Play begins Saturday in Corner Brook, N.L. The two local rinks, led by skips Bailey Horte and Joe Wallingham, will have their hands full against some returning stalwarts. 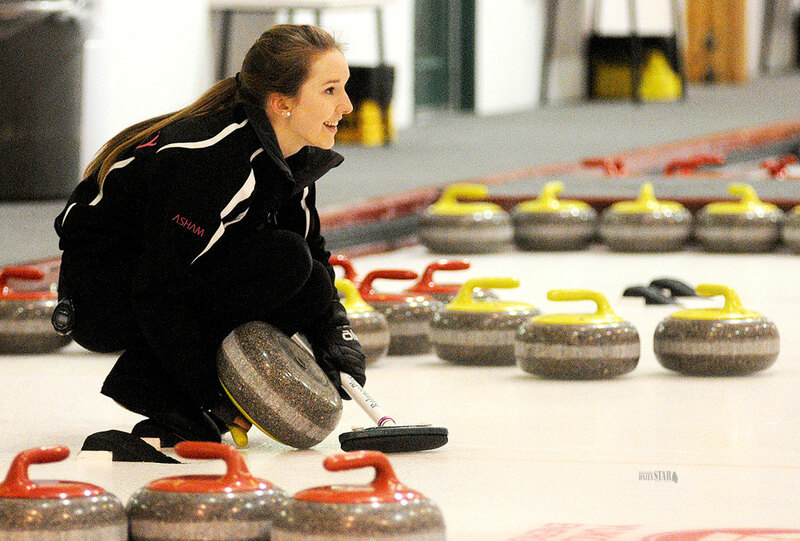 Both defending champion skips are returning to the 2015 M&M Meat Shops Canadian Junior Men’s and Women’s Curling Championships, including 2014 world junior women’s champion Kelsey Rocque of Edmonton, with new teammates, and Winnipeg’s Braden Calvert with the same team he had for last year’s victory in Liverpool, N.S. Also returning is the entire team that captured the 2013 Canadian junior women’s title in Fort McMurray, Alta. — Corryn Brown’s team from Kamloops, B.C. Other favourites set to hit the ice in Corner Brook will be two medal-winning teams from last year’s event – men’s silver medallist Rene Comeau of New Brunswick and 16-year-old rising star Mary Fay from Nova Scotia, who took bronze last season. Round-robin games will take place at the Corner Brook Civic Centre and the Corner Brook Curling Club. Once the top three teams for each gender have been determined, playoff games will be played at the civic centre. The competition format involves all 14 member associations of the Canadian Curling Association (10 provinces, plus Northern Ontario, Northwest Territories, Nunavut and Yukon). Joining Horte on the Yukon women’s rink are third Kelsey Meger, second Kelly Mahoney and lead Sian Molloy. Curling alongside Wallingham, meanwhile, will be third Brayden Klassen, second Trygg Jensen and lead Spencer Wallace. The teams have been seeded, based on last year’s results, into two seven-team pools for each gender and will first play a six-game round robin within each pool from Saturday through Tuesday. The top three teams in each pool, plus two teams with the next best won-lost records, then advance to the championship round for a further four-game partial round robin from Wednesday through Friday, with their earlier records carried forward. Meanwhile, the six teams of each gender that don’t qualify will meet in a seeding round to determine ranking for the 2016 nationals in Stratford, Ont. All members of the non-playoff teams will then compete in a mixed doubles competition on Saturday and Sunday.